The 100th anniversary package is available on the Charger and Challenger in both SXT Plus and R/T Plus which means that buyers can get this great looking appearance package with either the 3.6L Pentastar V6 or the 5.7L Hemi V8 and for Challenger R/T buyers, there is also the decision to pick between an automatic or manual transmission. The Dodge Charger and Challenger 100th Anniversary Edition package begins on the outside where we find a set of unique fender badges and 20 inch polished five-spoke aluminum wheels with painted Granite Crystal pockets sporting unique center badges with the 100th logo. Next, the 100th Anniversary package wears a Granite Crystal grille, a body colored rear spoiler and the stunning High Octane Red Pearl Coat paint shown here. The 2014 Dodge Charger and Challenger in the SXT Plus R/T Plus are very well appointed trimlines so the 100th Anniversary Edition package packs pretty much every standard interior amenity available in these two Dodge cars including the 8.4” infotainment touchscreen and a premium sound system with Charger owners getting a Beats By Dre system while Challenger owners get a Boston Acoustics system. The flat-bottomed steering wheel from the SRT versions of the Charger and Challenger has been added and those vehicles with the automatic transmission also get die cast shift paddles mounted to this sporty steering wheel. Also, these 100th Anniversary Edition Chargers and Challengers come with Nappa leather sport seats in either Foundry Black or a great looking Molten Red with a similar 100th Anniversary logo mounted on the seatbacks. Finally, the gauge cluster of each 100th Anniversary Edition Charger and Challenger has a special speedometer with the 100 mile per hour mark accentuated in bright red while the rest of the digits are black. In addition to the uniquely appointed vehicle, those buyers who opt for the limited edition 2014 Dodge Charger or Challenger 100th Anniversary Edition get a special owner’s package that explains the 100th Anniversary package along with a book that looks at the last 100 years of the Dodge brand. Chrysler has not announced how many of these limited edition models will be produced but they have announced the pricing. 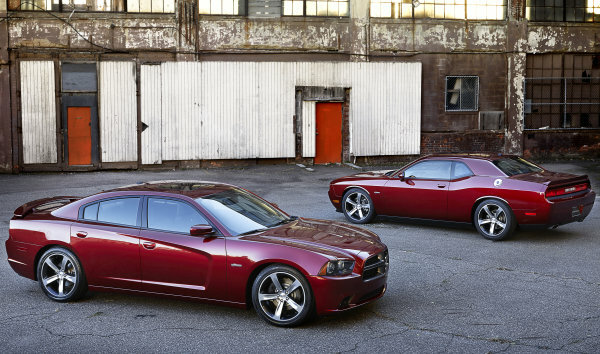 2014 Dodge Charger buyers will pay $2,200 to add the 100th Anniversary Edition package to their SXT Plus or R/T Plus and Challenger owners can expect to pay $2,500 more than the standard base pricing of the SXT Plus and R/T Plus packages. This means that the V6 Challenger 100th Anniversary models begin at $30,795 while V6 Chargers will start at $33,495. For those who want more power, the Challenger R/T 100th Anniversary Edition starts at $34,995 while the special edition Charger R/T starts at $34,695. Click any of the thumbnails above for a closer look at the 100th Anniversary Edition Dodge Charger and Dodge Challenger. Disclaimer: I am well aware that there are plenty of people out there who read this and were appalled by my suggestion that the Dodge Charger is a muscle car but considering that the Charger has everything that a classic muscle car had including some serious performance capabilities – I refuse to not consider the Charger a muscle car simply because it has two extra doors. I have recently bought the 100th RT / Challenger in a silver / black interior. My question is, how many of these cars were made in production?